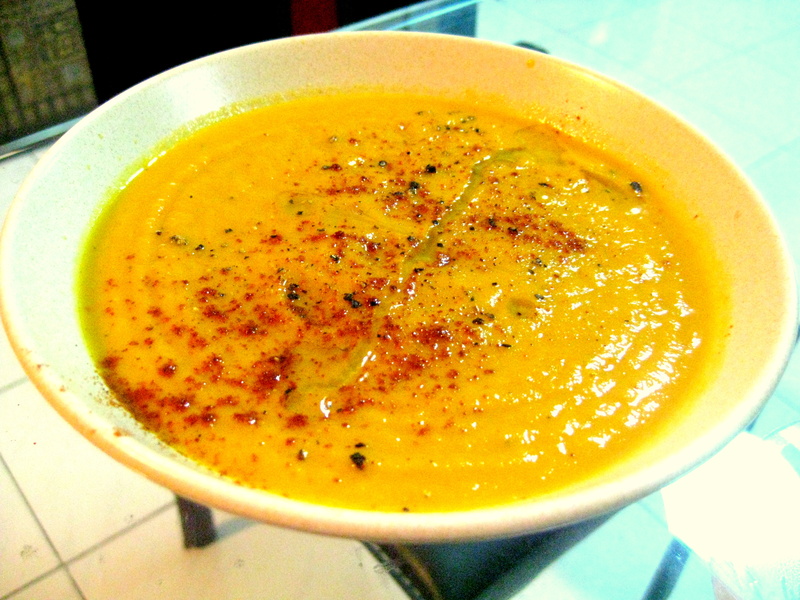 Curried Carrot Soup for a Rainy day, or Anytime really. Living in a tropical country means we have to endure the same hot and humid weather all year round. The only saving grace is, of course, the rain. Having said that it’s only nice if you are indoors and planning to stay that way for a little while because KL turns into a massive car park whenever it pours. Yesterday was such a day, we woke up, mesmerized by the sound of rain. Sure enough, true to its nature, the rain continued for the whole day. 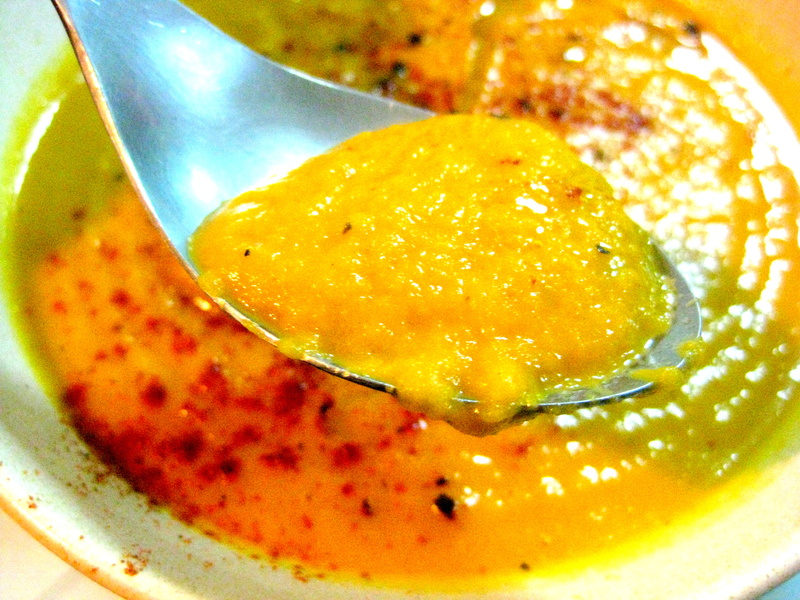 And what better to cheer up your gloomy, wet day than a bowl of bright orange piping hot soup? Carrot, the humble vegetable, takes centre stage. I’ve never thought of making carrot soup but having run out of most fresh produce before groceries shopping day, this was a pleasant surprise! The soup, velvety smooth, the natural sweetness of the carrots and onions, with the rich curry flavours and packing quite a bit of heat, it warms up your gut like no other. The bonus? It costs no more than 4 bucks to make! That’s if you ignore the truffle oil….. But if you have it, use it! By the way, yes it’s totally vegan! Of course, you could add some cream, or coconut milk, even butter but I felt this wasn’t even necessarily. Trust me, you’ll fall in love with it too. 300ml Vegetable stock plus more if needed. Preheat medium pot over medium high heat. Add olive oil, onions and garlic cook for 2-3 minutes until soft. Add carrots and celery, saute for 5 minutes more, then add all the spices and the vegetable stock. Bring to a boil, lower the heat, cover and cook until carrots are very tender, about 15 minutes. Process soup in until smooth and carrots are fully pureed. You might want to do this in small batches. Return completed soup to the soup pot and place back over low heat. If the soup is too thick, add remaining stock, to achieve desired consistency. Adjust seasonings. Serve while still hot, sprinkling more cayenne pepper and some black pepper. Add a dash of truffle oil. Enjoy the bowl of sunshine. Have this hearty soup on its own, or with freshly baked bread. Bliss. So, tell me, do you love soup and which is your favourite? Never thought carrot soup could be interesting. Tried it in many places but this one is the best ever. Nice touch with the little sprinkle of spices. Subtle and not mad. Just that nice little kick that makes a cracker out of a bowl. Want this again soon. Liked very much. You really need to get a restaurant going etc.